His faith motivated him to go solar. Drone aerial view of the Tremwel home (Credit: Douglas Hutchings). 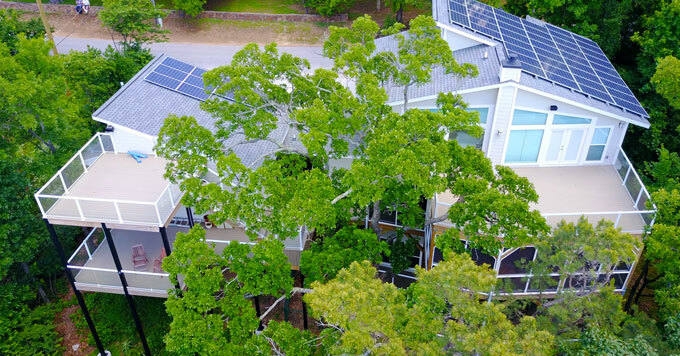 Three years ago, Arkansas resident Terry Tremwel built an ultra-efficient solar-powered home. He was motivated by more than a desire to save on electricity. He was also driven by his Christian faith. Tremwel’s large home was designed to be as energy-efficient as possible. It’s tightly insulated, and south-facing windows allow winter sun to warm the house. And its electricity comes from solar power. Tremwel says he gives tours and shows off his zero-dollar electricity bills when people visit. Through his example, he hopes to inspire others to protect and restore God’s creation. Reporting credit: Christina Hoover Moorehead/ChavoBart Digital Media.